Photo by: Wake Forest Sports Information Dept. The win was the Demon Deacons’ third consecutive victory, marking the first time since 1976 that the Deacs have won three straight events. Author: Wake Forest Sports Information Dept. 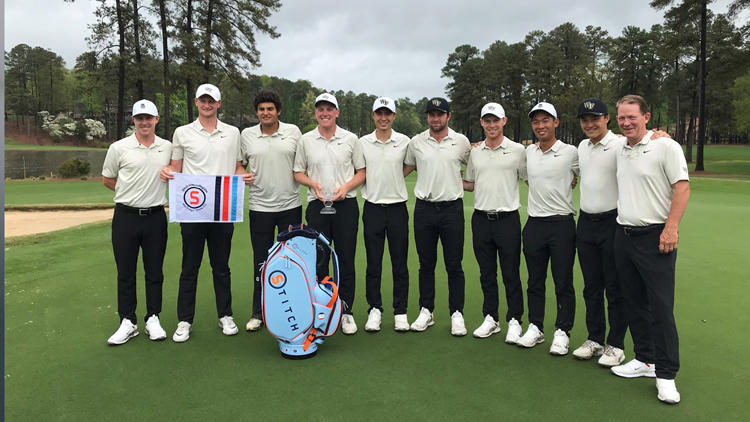 CARY, N.C. – The Wake Forest men’s golf team used a strong Saturday morning performance to rally for a victory at the Stitch Intercollegiate. The Deacs shot 8-under over the final eight holes of the second round at MacGregor Downs Country Club to erase a five-shot deficit and grab victory at the event, which was shortened to 36 holes by weather. The No. 3 Demon Deacons ended the event at 14-under, one shot ahead of No. 21 Louisville at 13-under. When rain halted play Friday afternoon midway through the second round, the Deacs were at 6-under, five shots behind the Cardinals at 11-under. The win was the Demon Deacons’ third consecutive victory, marking the first time since 1976 that the Deacs have won three straight events. It was Wake Forest’s fifth victory of the season, the most in a year for the program since five victories in 1983-84. Cameron Young finished at 8-under for the tournament after completing his second straight round of 68. He tied with NC State’s Stephen Franken for medalist honors, but lost the title in a playoff. It was his fourth consecutive top-5 finish. Eric Bae had his fourth top-5 of the season with a third-place finish at 6-under after posting a final round 68. Kengo Aoshima, playing as an individual, finished T-5th at 4-under. Eugenio Chacarra shot a second round 69 to finish the tournament at 2-under par. Lee Detmer and Parker Gillam rounded out the lineup at 3-over par. The Demon Deacons return to action next week with the ACC Championship at Old North State Club. The tournament runs Thursday-Saturday.